What in the world are they wearing?! 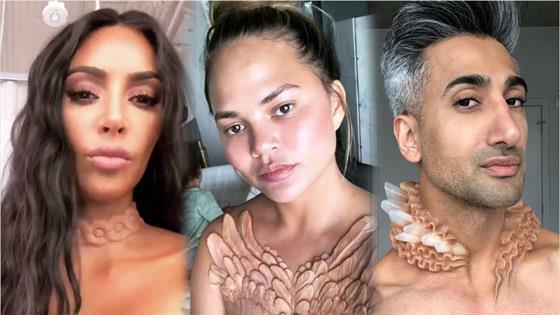 That's the question pop culture fans are asking after stars like Kim Kardashian, Chrissy Teigen and Tan France took to Instagram this week and showcased a new accessory on their skin. While followers couldn't stop staring at the "body modifications," we decided to do some digging and figure out what this new trend is all about. As it turns out, it's courtesy of a futuristic fashion brand called A. Human. Founded by Simon Huck, the company is described as the first line featuring body modifications instead of clothes. In fact, A. Human will have a presence at New York Fashion Week early next month thanks to a theatrical art experience that features an entire collection of designs. "Hey guys, I just spent the last 6 months creating something wilder and crazier than anything I've ever worked on before," Simon teased on Instagram. "The world hasn't seen something quite like this and I can't wait to share it with you. Get ready for the world of @ahuman." While pop culture fans try to understand the concept, celebs appear to be totally on board. "You guys!!! I was lucky enough to get an exclusive glimpse of A. Human's new collection, and it looks like I'm taking something home!" Tan shared on Instagram. The Queer Eye star added, "This lil beauty is The Tudor, and you can see it for yourself this #NYFashionWeek when they open their flagship store." Chrissy showed off her design while hanging out with daughter Luna. "Thank you A. Human. My new feathers. I'm feeling it," she said. As for Kim, her chocker necklace syncs to the beat of her own heart. And yes, this Keeping Up With the Kardashians star is very impressed. "My necklace glows like a heartbeat," she shared on Instagram Stories. "It moves to the rhythm of my heartbeat. Thank you A. Human." Experience the trend for yourself when the exhibit opens next month at Fashion Week. General admission will cost you $40.